You can save money when you go to the Arizona Renaissance Festival! GOLD CANYON, AZ — Where can one munch on an over-sized turkey leg or a candied apple, while meeting face-to-face with a young dragon named Fireflicker? Or find themselves on the sidelines cheering for their favorite knight in a joust? At the Arizona Renaissance Festival. The festival opens on Saturday, Feb. 9 and runs each weekend through March 31, 2019, plus Presidents' Day, on Monday, Feb. 18. The hours are 10 a.m. - 6 p.m., rain or shine. The grounds are located just east of Gold Canyon, Arizona, which is about 40 miles east of Phoenix. Before you go, here is everything you need to know. Escape rooms: Kings, queens and knights will be able to test their minds at five themed escape rooms -- "Escape the Plague," "Sword and the Stone," Merlin's Wand," "Pirate's Cove," and "Magical Forest." Groups will have 15 minutes to try and solve the puzzles. The cost is $5 per person. The CRAIC Show: A four-person "Celtic steampunk barbarian" band featuring "roguish vocals," a mandolin, bagpipes, violin, Nyckelharpa (Swedish instrument), and percussion. They will be at the New Melee Stage. Rick the Hypnotist: Rick Stratton is a certified hypnotist and will bring members of the audience to the stage in an attempt to hypnotize them. We're told taking a ride to the moon or winning a million-dollar fishing tournament are a couple adventures people could go on. Vaudeville Dancing Pig Show: Meet "Snorkel" the dancing pig at this circus-style show with juggling, balancing acts, and dancing. More food: You cannot go to the fair and not eat, right? This year, the fair has added gluten-free options, including two 10-inch pizzas and a New England clam chowder bread bowl. Other additions include BBQ pork shanks and roasted chicken, and the "Dragon Chop," a smoked bone-in pork loin chop served with seasoned mashed potatoes or smoked Gouda mac-n-cheese. 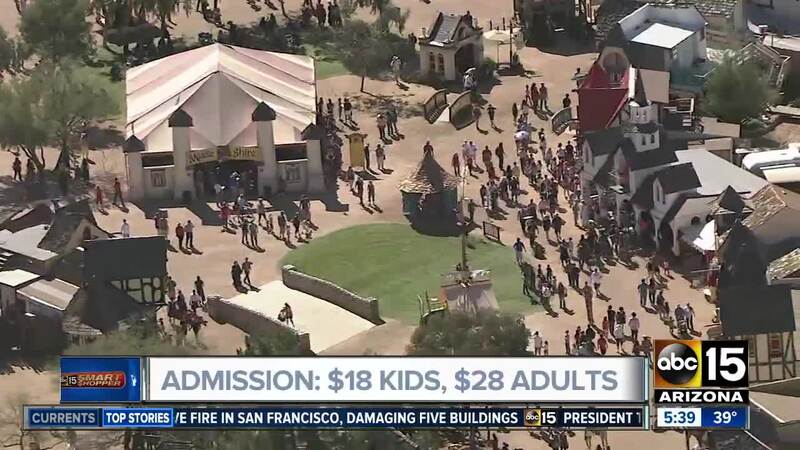 Admission to the Arizona Renaissance Festival increased by $2 per ticket compared to last year's prices. Tickets are $18 for children ages 5-12, and $28 for adults, 13 and older. There is no cost for children under five, and parking is free. We found a handful of ways to save a dollar or two on admission. Buy online: You can save $1 on admission -- $17 for children, $27 for adults -- when buying tickets online . There are no additional taxes or processing fees. More information . Buy at Fry's grocery stores: Shoppers can save $2 on both child and adult tickets at Fry's Food Stores compared to buying them at the box office. Tickets at Fry's are $16 for children and $26 for adults. Military discount: Active military members and their families can save $3 per ticket at the box office ($15 for children, $25 for adults). Military members need to show their military IDs, and spouses and children need to show their military dependent IDs. Senior discount: Those 60 and older can save $3 on regular admission at the box office. A senior ticket is $25. Two-for-one on adult tickets: On Feb. 9, 10, or 18 (President's Day), you can get two adult tickets for the price of one ($28 savings) at the box office. Fine print: You have to pickup the coupon from either Bookmans Entertainment Exchange or Hall of Frames. Hall of Frames also has a coupon you can download, here . Cobblestone Auto Spa has the same coupon, however, they require you to buy a full-service car wash to get the coupon. Free child admission: Booksmans, Hall of Frames and Cobblestone also have a coupon where you can get one free child admission with paid adult admission between Feb. 23 - Mar. 31. You can download that coupon from Hall of Frames, here . Is a season pass worth it? That depends on how many times you plan to visit the festival. A child's season pass (Squire pass) is $70 and an adult season pass (Royal pass) is $155. A child pass would have to be used at least four times and an adult pass would have to be used at least six times to surpass the cost of purchasing tickets individually. Ticket information . Gold Canyon, AZ 85118. The hours are 10 a.m. - 6 p.m., rain or shine. Jousting is arguably the main attraction of the festival, but it's definitely not the only thing to see. There are more than 2,000 costumed characters that will roam the 30-acre property, 14 stages with different acts and shows, and a marketplace with 200 shops. Jousts: There are three jousts each day of the festival: "Lord Mayor's Joust" at noon, "Princess' Joust" at 2:15 p.m. and "Joust to the Death" at 5 p.m. All are located in the festival's 5,000-seat arena. All shows are included with admission. Shows: Many fan-favorite acts are back at this year's festival, including Adam Crack's fire whip show, Ancient Art of Falconry, The Ded Bob Show with his pal, Sluj; Green Man the tree; and Shamus, the "professional insulter." Shows are included with fair admission. Games and rides: Guests can practice target shooting with a bow or crossbow, or participate in a paintball battle, or throw a tomato at a peasant who is insulting you. In terms of rides, the Arizona Renaissance Festival has people-powered rides. Some of these have additional fees. Pleasure Feast: The "Pleasure Feast" is a five-course meal and show at the King's Kitchen, and the cost includes admission to the Arizona Renaissance Festival. This year's spread is from "The Duke of Bavaria" and features split-pea soup, German potato salad, boneless prime rib or baked chicken Paprikash, and a dessert. The cost is $75.95. Tickets should be bought in advance. Marketplace: There are more than 200 shops featuring jewelry, leather, lotions, soaps, metalwork, pottery and ceramic art, and musical instruments. Themed weekends: There are eight themed weekends throughout the festival, and some have special events with them. Feb. 23-24, Time Traveler: AZ T.A.R.D.I.S. will be around the realm for photos, Feb. 24 is "LGBTQ+ Day"
Visit the festival's website for more information.